Over the past decade, airlines have decided to spice up their flights by producing safety videos with new twists. Now, instead of smiling stewardesses and boring diagrams, several airline companies have come up with creative ways to tell you how to correctly buckle your seatbelt. This video, produced by Virgin America in 2007, began the steady trend of attempting to entertainment their audiences, rather than just preach safety to a crowd of sleeping or frustrated flyers. It's dry humor and doodle-like design are thanks to Anomoly, a branding firm and the video's animators, Gordon P. Clark, Nick Hewitt, and Mike Overbeck. After the launch of this quirky animation, Delta Airlines and Air New Zealand joined in the fun. In 2011, Air New Zealand released a video featuring none other than Richard Simmons. Starting out as a normal safety video, we are pleasantly surprised when a fully decked out Simmons struts center stage with his jubilant crew not far behind. A good tactic by Air New Zealand, knowing it takes a special person to ignore Simmons' charisma. My personal favorites are from this year, from Delta and Virgin America. Delta takes us back to the 80s with their retro take on airplane safety. Sporting mullets, neon and recognizable icons such as Alf and Kareem Abdul-Jabbar (Airplane! anyone? ), the confused passengers demonstrate how to use modern safety technology on the plane. Virgin America's latest video takes the cake for me. Starring youtube sensation Todrick Hall by director Jon M. Chu, this video is another turning point for safety videos around the world. The entire production is a music video, complete with clever lyrics and amazing dance moves from the cast without losing the educational purpose. After this, I'm excited to see what the following years of safety videos have to offer. Last but not least, this ridiculous safety video from Air New Zealand has nerds everywhere booking flights to the country where Middle Earth was set. Using their connection with the film trilogy Lord of the Rings, Air New Zealand came out with a video in 2012 featuring our favorite characters from the movies struggling to follow safety instructions. There's even cameos from Sir Peter Jackson himself, and the ever loveable Gollum. No matter how awesome or awful these safety videos are, anything's better than the dry, snooze worthy videos that came before. Keep up the good work guys. The 'found footage' genre, in my opinion, is one of the most compelling ways to shoot horror films. The events on screen are usually seen through a camera of one or more characters involved, who often speak off screen. The filming is done by the actors themselves as they recite their lines off camera. It generally has shaky camera work and naturalistic acting is often used. This genre dates back to at least as far as the 1980s in Cannibals Holocaust, it then became increasingly popular after the release of the Blair Witch Project, 1999, and Paranormal Activity, 2007. The 'footage style' really allows the viewer to believe in what they are seeing; it more relates to the viewer, like it is something that they could have recorded on their video cameras at home. The Paranormal Activity series has most definitely become one of my favorite movie series because of the way that it is shot. It really makes me believe that all these events are true. Sorry for the spoiler if you actually believed that this series is real. One of my favorite camera shots throughout this series was used in Paranormal Activity 3. The device that created this amazing shot was the "fan cam." One of the actors in the beginning placed a camera on top of an oscillating fan allowing the camera to record multiple rooms. This creates a lot of tension in many different scenes throughout the movie, not only from the speed that the camera was oscillating but also the placement of the camera. Having the camera set up in the living room which is between the kitchen and the dining room. There were so many scenes that used this camera to scare the hell out of people. Having the movie being recorded in more of a naturalistic way, but also having unique shots, and having the movie be part of the found footage genre definitely work for these movies. When I watch these movies I have to admit I get a little frightened to sleep alone at night. These are must watch movies in my book! I’d like to preface this writing by saying that Little Miss Sunshine is one of my favorite movies. All the way from the writing, to the filming, to the performances, there is an extreme level of care and of course, the inevitable family drama that I love to watch and write about. If you haven’t seen the movie, STOP READING. It is really great, and I recommend watching it before you read this post because I am going to be talking about one of my favorite scenes in the movie that gives a major plot point away. At this point I’m assuming that those of you still reading have seen the movie so I won’t go into great detail explaining what it’s about. So the particular scene that I am referring to is when Dwayne freaks out because he finds out he is colorblind. I find this scene brilliant for multiple reasons. The beginning of the scene sets the stage perfectly. Dwayne, who has taken a vow of silence until he is allowed to enlist as a Navy pilot, is in the back of the yellow van, as his sister Olive amuses herself by giving him an eye exam with a hospital pamphlet. Next to Olive is her Uncle Frank, and in the front are both parents. The scene starts out quiet normally, and there is no evidence of any topic of conversation being very important. After Olive tests Dwayne’s vision, she moves on to a colorblindness test that Dwayne takes to appease her. She asks him what color the letter is inside the bubble on the sheet, and Dwayne responds on his little notepad asking what she is talking about. This is where the greatness of this scene starts to explode. That one word may be one of my favorite lines in a movie just because of how honest it is. In that one line, the audience is able to hear and feel the anguish and heartbreak that Dwayne is feeling. Not to mention that way he performs this scene is so real. Within a few moments of screaming, Sheryl tells Dwayne that she knows he is upset, but they have to go if they are going to make it to the pageant. This causes Dwayne to go on a rampage about how much he hates his family and how screwed up they are. After his rant, there is silence. Olive then makes a gesture by walking down the hill and simply hugging him. The way she does this is so innocent and purely kind. After a moment, without a word, Dwayne gets up in resolve. He picks Olive up and carries her up the hill, and the family gets back in the car and on their way. This scene is a true testament of good cinematic writing and great acting. I would recommend it to anyone (especially if you are like me and enjoy hilarious movies about dysfunctional families). "Orange is the New Black" is a Netflix original series based on Piper Kerman's memoir Orange is the New Black: My Year in a Women's Prison. The show follows Piper Chapman, who is sent to prison for carrying drug money for her ex-girlfriend many years ago. Piper acknowledges her fault and tries to keep an open, positive mind in the facility. 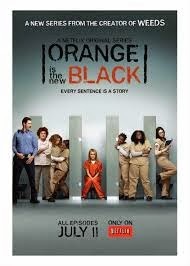 But by the end of season 1, the injustice and severity of the prison causes Piper to snap, leaving the audience with an excellent cliff hanger. The show's initial success has set high standards for the upcoming season. It's anticipated that season 2 will have even more drama and will introduce new characters. Lori Petty was added to the cast, although there are no details on her role. In fact, OITNB has barely released any details about the second season. According to Jason Biggs (Larry Bloom), this season will be "better than the first." The show presents the audience with a multitude of different cultures, lifestyles, and women. Each character comes with a unique and realistic backstory, and being in a prison allows the audience to see the characters in their rawest form. Creator Jenji Kohan truly outdid himself with this series. I personally can't wait for season 2 to finally be released. If you’re looking for a show that explores the kindness and generosity of the human spirit, than The Sopranos is not your best option. David Chase's television classic focuses on the anxieties and personal struggles of middle aged mobster Tony Soprano, played by James Gandolfini, as he goes through therapy. The show's viewpoint of people and the psychological makeup that makes them tick is deeply pessimistic. Everyone is selfish and self-serving. Conversations are not exchanges of thoughts and ideas as much as a series of thoughts spoken aloud to one another with little to no value given to what the other participant says. Characters store emotions up inside of them for years until they explode, often at the expense of people entirely uninvolved with the situation. And by the end of the show, many characters who claimed to have changed themselves and their evil ways find themselves in a far worse place than they ever started. There are moments of empathy and humanity, and these scenes are indeed powerful, but they are few and far between, more often the exception to the rule. Basically, the show seems to believe that people are often no good. This is such a deeply pessimistic viewpoint runs the danger of being far too oppressive viewpoint. But it never does, in no small part thanks to the music. As we watch the characters live their everyday lives, Frank sings nostalgically about his days of youth. But intertwined with this nostalgia is a sense of melancholy. As each verse passes, the character gets older and older, yet he still finds himself dwelling on the past. The song ends in the autumn, with the character reflecting on all the good times. Autumn, the season where the weather gets colder and the plants and trees start to die. The brutal winter is not here yet, but it is on its way. But these are the good times. This may be as good as it ever gets. Revel in it, enjoy it. Because it may not always be this way. And so as we watch these characters live their everyday life, there a combined sense of comfort at how things are and one of dread for what is to come. I was able to articulate this by analyzing the song, but it is understood on an emotional level as soon as one watches it. That the show could conjure such a complex emotion out of a short three minute montage is laudable. Magical moments like this are strewn all over The Sopranos seven year run, to the point where it makes the perfect mesh of song and image seem easy. There is such a consistency to the one of the music, with much of the selections being a heavy dose of classic rocks songs such as The Rolling Stones and The Kings mixed with a hint of deeply humanistic, sometimes spiritual songs. The music landscape almost becomes, if not another character, than an entirely different viewpoint for the show to articulate and further its overall perspective. A song does not only comment and accentuate the single scene it plays against; it works alongside the established musical palette and deepens our understanding of the overall show. The song selections come together and form a shading of the show’s viewpoint as important and tangible as the writing, acting and cinematography. And whereas the other shadings of this perspective typically work to further the show’s pessimistic declaration of humanity, the music instead offers with a deeply emotional and sentimental tone that allows us to enjoy the characters and occasionally empathize with them. This is not the only aspect of the show to make these characters and the shows viewpoint tolerable, humor also being quite important to what makes the show work, but it may be the most affective one. Scandal is in its third season on ABC, but I only started watching this show this week. I have seen friends post on social media about the show, particularly about the main character, Olivia Pope, and their posts and the commercials I've seem have grabbed my interest. I can't decide if it's the characters, the quick, witty dialogue, or the editing that draws me into the show most. The characters each have very intriguing personalities, and when they come together it makes for a very interesting character dynamic. Their relationships can be both professional and personal at the same time, and you're drawn into both stories without missing a beat of either one. The dialogue can be incredibly quick and witty, which is a characteristic I appreciate in television and film. I love the fast pace. It keeps my attention the whole way through. The types of shots and editing also fascinate be because editing is what interests me most about this field of work. There are a lot of really quick cuts and really mind-blowing shots. The directors, cinematographers, and editors get very creative with how they show you things, rather than just blatantly showing you the obvious. Instead of getting a shot of a security camera to let you know that a character is being watched, they show you a shot through the security camera. When a character is looking at something on a computer screen, the shot appears to be taken from behind or inside the computer, showing you what's on the screen as well as the character's face. This is not only a fascinating method, but it also allows you to see the character's reaction to what they're seeing on the screen. In just one episode, the show has grabbed by interest and made me want to watch more. Shonda Rhimes has definitely created a successful show. I cannot wait to see more. Our whole lives we are taught that you can't do it all in a night. You shouldn't wait until the last minute. Don't stress yourself out by doing it all at once. That is great advice for things like big projects or studying for an exam, and some people will say the same sort of things about watching a television show. They'll tell you that you should watch each new episode when it premieres and then wait until until next week to find out what happens. They may try and tell you that it's unhealthy to stay up into the wee hours of the night watching just one more episode, which we all know really means 4 more episodes, but here are the top three reasons I think it's better for you to take a whole weekend to watch an entire season of a show. One of the things that draws you into a show and keeps you hooked is having a connection to the characters. No one wants to watch a show about someone they can't relate to. When you watch an entire season back to back you allow yourself to get to know a character on a whole different level than if you were to watch it as it premieres. You allow yourself to be fully immerse into the life of this character. You're allowing yourself to react to situations in real time with the characters. Emotions are always strongest when they are raw and that's what binge watching allows. You don't have time to logically think out how you feel. Your reaction is pure emotion the way a characters reaction would be. We all keep up with a lot of shows, especially if you're a TVR major like myself. Everyone has at least 10 shows to tell you about when you ask "what's your favorite show?" It's a lot to keep track of from season to season or even episode to episode. However if you watch each episode of a season back to back, you don't have time to forget. It's easier to remember what happened in the last episode when the last episode was just watched a few minutes ago. You'll have an easier time remembering small characters who only show up once in a blue moon because it won't have been that long since their last appearance. So next time you get hooked on a show, don't feel bad about watching that next episode right after it. Go ahead, stay in bed for a week straight and do nothing but watch an entire series. You deserve it. Old Spice has recently started a new ad campaign called the "Internetvention". The old spice internetvention or internet intervention, starts off as the most ridiculous advertisement for an "executive spray tan party". When I first saw this ad, Old Spice really had me fooled into believing this ad was an actual ad for a spray tan party. But if you keep watching, the ad shuts down and the Old Spice man makes a return appearance. Here is the advertisement. I got to say Old Spice really did a good job with this ad, it had me in complete shock and awe. Old Spice is known to have come up with amazing ads before but this one had the biggest shock value in my opinion. My latest Netflix binge is Showtime’s hit drama series “Dexter.” I don’t typically enjoy shows with blood and gore, but “Dexter” is an exception. The unique storyline, strong writing, and talented cast make this one of television’s best crime dramas. Protagonist Dexter Morgan is “born in blood” after witnessing his mother’s brutal murder as a toddler. This traumatic event creates a darkness in Dexter, a thirst for blood only satisfied with murder. Dexter’s adoptive father Harry teaches him a moral code to protect his secret and survive with the rest of the world. “Dexter” challenges our own code of ethics and morals as we try to determine the true essence of Dexter’s character. Dexter is a self-described monster who spends his entire life faking normalcy. He claims to have no emotion or conscience, and tries to fake emotion to seem more human. Dexter finds comfort in Harry’s code and nurtures his evil streak. His killings become ceremonious -- a sacred ritual where he feels alive. Harry’s code forbids killing innocents, so Dexter uses his forensics job with Miami-Metro Homicide to discreetly hunt down murderers to put under his own knife. He twists his darkness into a better evil. I think most would agree that someone responsible for dozens of murders doesn’t quite fit the bill for a classically ‘good person.’ Anyone finding satisfaction in murder is clearly mentally unstable and a danger to society. But Dexter isn’t killing just anyone. He only targets other killers. The audience recognizes these facts, and chooses to root for Dexter. Sure, he’s a serial killer, but does that make him pure evil? He’s much more than a serial killer -- he’s a loving father, husband, and brother, and he’s doing his best to keep everyone happy and safe. I’m not sure if killing murderers classifies Dexter as good or bad, but he’s not as evil as he believes. Dexter’s blind obedience to the code proves to be one of his biggest weaknesses. Harry told Dexter he could never change, and would always have to hide his true self. The code restricted Dexter’s individual growth over the years, but he very slowly throughout the show realizes he’s been a slave to the code. In a way, he was forced into this lifestyle. Even though he denies having emotion, we know he’s only fooling himself. Part of Dexter’s kill ritual pays tribute to the victims of his target as he explains to the criminal why he’s going to end his or her life. This proves Dexter has some sense of right and wrong, indicating he does have a conscience after all. Unfortunately, having a conscience doesn’t make you a good person by default. Which begs the questions, is Dexter more good than he is evil? Are his actions justified? Or has Dexter manipulated viewers into thinking he’s more human than he really is? The Batman movie franchise has had a long tenure and been interpreted by many actors, directors and writers. While the characters and stories follow the general plot lines of original DC comics, their portrayals have varied from each iteration to the next. The Christopher Nolan era of Batman could be argued as one of the most masterfully depicted stories of Bruce Wayne. Over the span of 3 films he incorporates numerous villains and delves more deeply into the darker side of Bruce Wayne's psyche. The character development seen in the films strikes me as odd, however. The villains of this trilogy seem to be more dynamic characters.While watching, I find myself enjoying the "bad guys" more often than the hero. They have more personality and pizzazz which in turn causes me to almost root for them. One of my favorite of the villains is The Joker, portrayed by Heath Ledger. Yes, he's maniacal. Yes, he's murderous. But most of all he's exciting, unpredictable and so irresistibly captivating to watch. There are so many wrinkles that begin to unfold from the moment the movie begins and for the span of the film he steals the show. Our hero however seems to take the back seat to these master villains. Bruce Wayne as portrayed by Christian Bale is more and more as the trilogy progresses a self-righteous, self-loathing billionaire with a perceived obligation to his city. He seems to be the only character that tries to escape their true self. He does this by becoming Batman. At first a noble pursuit, Batman soon becomes an escape for Bruce. He uses it to avoid the constant pressure of being a celebrity, the pain of lost loved ones and a possible means to a final end, his death. Throughout the series this character is pretty static, filled mostly with anger and grief with occasional hopeful moments which are usually snuffed out. While he's not as exciting to watch as say The Joker or Bane, his role is the backbone on which the story is built. His unwavering and steadfast behavior is what allows him to survive again and again no matter what he faces. While he may not be as likable, he is still the hero. Next time you find yourself watching The Dark Knight trilogy, ask yourself, "Who's better?" The Hero? Or the Villain? You've probably heard his music. Actually, I guarantee that you've heard his music because it is that recognizable. The man's name is Hans Zimmer and he is the closest thing we have to a legend of scoring today. Inception, The Dark Knight, Kung-Fu Panda, Gladiator, The Pacific, Sherlock Holmes, and even Call of Duty Modern Warfare 2 are just some of the media that Hans Zimmer has provided scores for. His style is very intense and relies heavily on the brass section of his symphony to move the action along. This is best seen in Inception and The Dark Knight movies that have a lot of action and require an epic score to set the tone. The video above is a live performance by Zimmer and his symphony at the Inception premier. They play a song from the movie which is meant to accompany an action scene but still sends the same message without the video sync. What I find most interesting about his work is his ability to blend electronic instrument with real ones to create an effectively moving score. Many purists would say that this is "cheating" but Zimmer does not flaunt this technology but rather uses it to enhance and support the real instruments he uses. This shouldn't come as a surprise because Zimmer was in "The Buggles" who sang "Video Killed the Radio Star" which practically paved the way for the advent of electronic instruments and music. Basically this guy is the man especially since this is how he describes his process..."I wake up around noon, light a cigarette, get a cup of coffee, sit in the bathtub for an hour and daydream, and I usually come up with some ideas... " All in all a very talented individual who doesn't accept mediocrity in any movie he scores. Next time you're watching a movie notice the score and what it does to add to the action and dialogue. Over my winter break consisting of an entire month, I found myself watching several movies with my family and friends. Ever since being in an IB Film class back in high school, I have analyzed and looked for a deeper meaning into the films and television shows that I watch. I look for lighting techniques, along with camera angles and other cinematic techniques that I was taught and continue to learn every day that I am in a studio/field based class. That being said, I found a few movies I watched over break visually fascinating. I first saw American Hustle, not only did the acting blow my mind, but the way the characters were portrayed just worked overall. I found the humor to be a key part of the film and added substance to it. The portrayal of love and fraud was smart and sophisticated. While loving that film, I then saw Wolf of Wall Street. Going into it, I had very high expectations. All I heard was how amazing this film was. Scorsese is a genius, no doubt about it. The various camera shots and direct address was great and definitely created a relationship with the audience. However, I found it a bit too long and over the top. Tina Fey and Amy Poehler's joke at the Golden Globes stating, “We're going to get this done in three hours – or as Martin Scorsese calls it, act one" was one of the best jokes of the night. Many were annoyed at the fact that throughout the entire 3 hours of a movie, they did not mention the victims of this entire Wall Street disaster that Jordan Bellfort and several other sleazy stock brokers caused. Another film I saw over break that is worth mentioning was The Untouchables. You can't go wrong with a killer cast, starting with Kevin Costner, Robert De Niro and Sean Connery. My favorite scene in that movie is the famous scene on the stairs. The build up of the scene lasts a little more than 5 minutes, adding more and more suspicion. Eventually the shoot out happens and we reach the turning point of the scene. This is one of the most famous scenes ever to be done, especially by De Palma. Overall. I enjoy the uniqueness and specialty the way films are made and spent a lot of time over break analyzing and appreciating these incredible works. Almost all movies strive to have perfect continuity throughout, but in theory some continuity errors are bound to happen. Some may happen because the scene was shot on two different days or some can just happen because we are humans and we aren't always perfect. There are just hundreds of reasons why. Youtuber CinemaSins states "No movie is without sin. We exist mostly just to remind you of that." CinemaSins is popular on Youtube with 1,585,174 subscribers and 188,989,171 views on all his videos combined. CinemaSins has combed through multiple movies looking for these continuity errors which people may or may not pick up when they are just watching the movie for for themselves. After he calculates how many errors are in the movies he creates a video showing all the errors and explain why they are continuity errors. I found it truly fascinating how he is able pick up all of these errors. One of my favorite videos he has posted was Everything Wrong With Back to the Future in 8 Minutes or Less. There are 55 errors, or sins as CinemaSins calls them, in this movie, which is pretty high compared to other movies he has gone through. I have seen this movie at least thirty times throughout my life time and have not picked up a single one of these errors. There were sins from the appearance of Doc in his Delorean to the nerd level of George McFly. Ater watching this video I have to watch the movie over again to see for mine own eyes these errors. I have watched many more of CinemaSins videos and I will definitely not see those movies like I used to. I definitely recommend watching other videos that have been posted by CinemaSins you never know what you will find. If you ask me, Malcolm in the Middle is a prime example of pure intelligence in comedic television writing that goes beyond the realm of humor. It is a show that is not only relatable to a vast population, but also uses different techniques to illustrate an initiative I have rarely seen. One episode that I think portrays this idea extremely well is season 2, episode 20, Bowling. If you are familiar with the show, you know that it portrays a working class family consisting of husband and wife Hal and Lois, and their four sons, Francis, Reese, Malcolm, and Dewy. Each character has their own specific traits that create the ideal dysfunctional family with all the mishaps and schemes you would expect and also the ones you never would have thought of. Ultimately, it is the chronicles of a family that is in a constant state of battle on the surface, but deep down has a strong and unique love for one another. I could go on and on about each character and his or her development through the series, but instead I’m going to focus on this one episode in particular and why I think it is so brilliant. It starts with the entire family in the kitchen getting ready for the day. Malcolm and Reese set the scene by asking which of their parents is going to drive them to the bowling alley, and with that, the screen splits in two. The entire episode is an explanation of two different scenarios and the events that transpire because of the decision of each parent driving while the other stays home to take care of Dewy. It begins with Lois driving the kids, lecturing the boys in the car about their behavior. Then there is a cut to Hal in the car with the boys telling them how the bowling alley is a great place to meet the ladies. The next scene has Lois entering the bowling alley with the boys behind her looking extremely miserable and embarrassed. This shot is interesting because as they exit the shot, without a cut, Hal and the boys reenter, with an entirely different demeanor about them. Now I won’t go overboard by explaining every interesting shot in the episode, because then you would be here all night, but included were multiple shots similar to the style of this one and various split screen moments. As far as the plot goes, it is interesting to see things unfold. For example, in the storyline where Lois takes Reese and Malcolm bowling, Reese starts out flirting with a girl at the alley, but Malcolm ends up with her. This is unlike the scenario where Hal takes them because Malcolm begins with the girl, but neither of the boys ends up with her. There are many similarities and differences between the two shorelines that seem to bring the intelligence level of the show up in a way that is beyond what you would assume. What I find most fascinating about the episode though is that in the end, there is one final split screen with each parent on the couch and the other entering the house. On the couch they ask how the trip went, and the parent that took them replies simultaneously with the other, “Next time, you take them.” And that is the end of the episode. I love the way that even by the end of the episode, the viewer still has no idea which series of events actually took place. 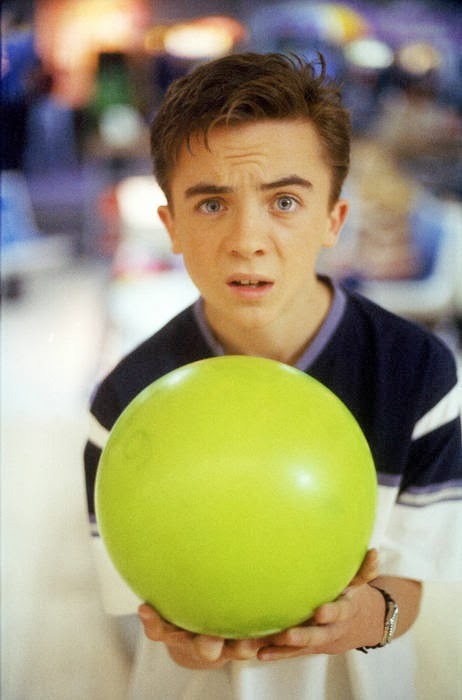 Malcolm in the Middle is a show that I would strongly recommend. It is a witty and relatable comedy that I think everyone should watch at least once.